The days of manual product tracking are numbered, and The Kennedy Group is ready to help your team move into the modern era of supply chain management with RFID solutions. These labels are cost-effective alternatives to traditional labels, and they will improve accuracy while saving time in your warehouse. 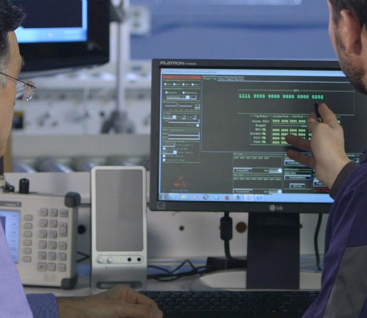 Dedicated systems engineers with expertise in equipment configuration and inlay placement, a devoted customer service team, knowledgeable sales and marketing staffs combine to offer sustainable solutions to companies’ supply chain challenges. Don’t spend another year wondering how inventory will go and stressing about efficiency. 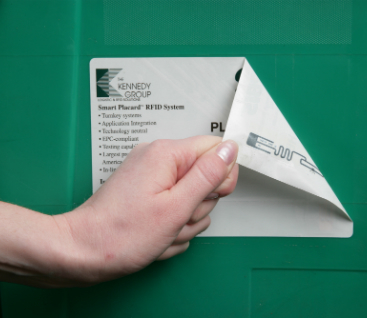 The Kennedy Group has an RFID solution available to help automate your process. We’ve got you covered from the warehouse to the retail rack! Our Smart Placards® and Smart Nameplates° ensure that your containers and racks are all accounted for. Our SmartCard™ Sliders are durable and made to handle extreme elements, and our SmartCard™ Tags have changed tracking for the air conditioning market. But RFID tracking doesn’t end in your warehouse. Our SmartAsset retail tags help you track your inventory in your store and our SmartTherm™ Tags help you track important documents and files and boxes. You’ll be covered from the beginning of your inventory cycle to the end with The Kennedy Group! Can I Afford RFID Tracking? The Question is Can You Afford Not Having It! RFID tracking is similar to the bar code technology we are all familiar with from our visits to retail stores – however, it uses radio signals to transfer information. A receiver, be it hand held or stationary, receives the signal and sends the information to a computer. Thanks to this information transfer, you can easily track packages and know exactly where your inventory is at all times, cutting down the instances of human error that plague supply chains. The value is easily quantified by the reduction in shrinkage you’ll see with a better system in place. The initial cost is slightly higher than a traditional label, but once your system becomes more efficient and your inventory numbers set all-time records, you’ll understand that this is the missing link you’ve been searching for to tighten up the way you track merchandise. The applications are endless. RFID tracking can be used to track virtually anything and can be used with almost all of our placard options. No matter the industry and no matter the product, The Kennedy Group has an RFID solution to help you!